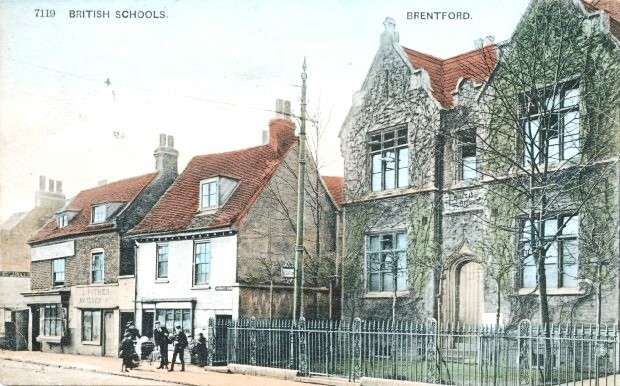 Roger Williams provided this tinted postcard scan showing the British Schools. It was sent in 1905 and the tram stop confirms the photo was taken in the early 1900s. Lynn Hayter sent a scan of the same card in 2012 including the back, from which she transcribed the text, see below. The British Schools were built in 1859 and renamed the Rothschild School by 1906. The site includes an example of a certificate issued from this school to a pupil in 1894. The 1866 Post Office directory lists 1866 John William Tate as the master, Mrs Louisa Tate the mistress. The directory notes that the schools cost £3000 to build and accommodated 450 children. They were not only neat and commodious, but models of the most approved educational appliances: these schools have long maintained a distinguished character. In 1898 the master was Evan Phillips, who later was a councillor and his wife Mrs Emma Phillips was mistress. The school could accommodate 700 children, average attendance was 600. In a 1911 directory it was noted the school could accommodate 730 children but had an average attendance of 511 children. Infants were no longer taught there. The photo shows Old Spring Gardens with a sign for J. Roger(s) to the far left, then no. 255, which was occupied by Henry A Hine, signwriter and house decorator in 1901, then James Pither, bricklayer in 1891 and 1901 censuses, with a sign 'Builder' at no. 256. The cluster of people are outside no. 257, the right of way under part of the cottage to the school playground is visible. The sign 'Hardings Court' is above this entry. The school itself has handsome wrought iron railings and tall classrooms with large windows. It is set back a little from the road and has a lot of bare trees at the front - not a summer photo. The site has some class photos taken inside during the 1920s. "Thanks for letter. It is very kind of you to say I may dispense with A. but I'd rather you did it thanks!! Have been over list with Pa & very few alterations. I can pack his Camp things with W's help - They don't go until Sat: morning DB." A check of the 1901 census showed numbers 33 and 37 Fonnereau Road, Ipswich (indexed as FonnereaN), but no sign of no. 35. In 1911 the house was occupied by Edith Jane Green and her servant Rose Catchpole, the property had 9 rooms. A 1900 trade directory records James Price teacher of music, at 35 Fonnerau Road, and also notes that there was access to the public arboretum from Fonnereau Road. Information about properties up to and including no. 257 and the schools and further along the High Street.